The Text tool is progressively improved. 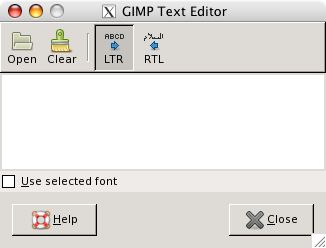 One of the greatest improvements of GIMP 2.0 over GIMP 1.2 is in the handling of text. In GIMP 2.0 and 2.2, each text item goes in a separate Text layer, and you can come back later to the layer and edit the text in it. You can also move the text around in the image, or change the font, or the font size. You can use any font available on your system. You can control justification, indentation, and line spacing. With GIMP-2.6, you can draw a bounding box (a rectangular frame) for the text on your image and you can adjust this rectangle in the same way as a rectangular selection. 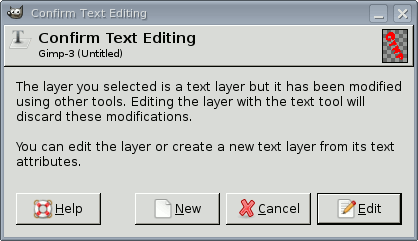 The text goes on being edited in the Text Editor, but it is automatically wrapped within this box. Actually, you can operate on a text layer in the same ways as any other layer, but doing so often means giving up the ability to edit the text without losing the results of your work.